Service kit for GAS IT vapour filters for 21.8LH gas bottles & gas tanks as fitted to motorhomes, caravan, campervans, farrier, road repair industries - GAS IT Leisure Gas Bottles, Gas Cylincers and Gas Tanks - Catering, Motorhome, Campervan, Caravan, Farrier and Road Repair Refillable Gas Solutions. Replacement High Capacity Filter kit for our latest GAS IT Vapour Filter range ( PT Number GI-VF-009 to GI-VF-012 ). 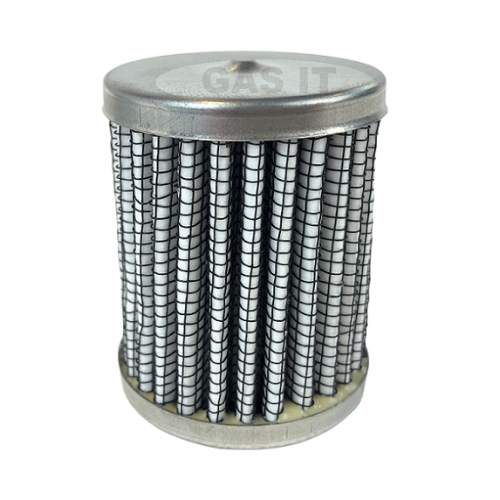 Please note : This service filter kit will not fit the GAS IT Shorty vapour filters so please check the details below to confirm if this size filter will fit your existing GAS IT filter body. Its an easy to do service and replace the filter. Filters the dirty, oily gas vapour before it hits your regulator and internal appliances. High flow rate filter with reinforced metal provides secure filtering in all conditions. Large, Pleated Surface area filter captures more contaminates with low risk of blockage. We recommend you check your filter for oily contamination and a dirty filter every 12 months and replace internal filter as needed. We recommend filter should be changed every 12 months to be well protected or sooner if used in a none leisure or high gas usage application. Maximum Operating Pressure 30 bar. Working Temperature -20°C to 120°C. Size of GAS IT High Capacity Service filter.